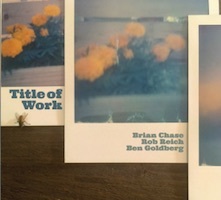 Brian CHASE, Rob REICH, Ben GOLDBERG: Title of Work (2018). whorls; eidetic; condign; countenance; portends; entertain; “ongoingness”; anfractious; human image. Chase (drums), Reich (accordion), Goldberg (clarinet). BAG Production BAG 013 (1 CD) (http://www.bagproductionrecords.com/). Purchased from Downtown Music Gallery, NYC. April is Jazz Appreciation Month (JAM). With my aversion to Uptempo and Loud, that could be a missed opportunity, but Messrs. Chase, Reich and Goldberg have provided a splendid solution. Brian Chase got kudos in the Yeah Yeah Yeahs, but I’m inclined towards his varied avant projects like this May 26, 2016 trio. Also a skilled recordist, he achieves a vivid yet subtle palette that will interest fanciers of serious headphones, like me. The challenges are rendering Reich’s accordion and Goldberg’s clarinet as seamless, and conversely making them distinct. These are addressed early and often. Whorls (track 1) opens with spiky, independent parts before drum rolls announce the flow implied by the title. After a drum intro, eidetic (track 2) finds a slow quasi-unison Reich and Goldberg – almost a super-instrument, but Goldberg has time to insert decorative fills. Nothing outstays its welcome (nine tracks occupy only 41:16) but the peak is entertain, track 6 and the longest at 9:14. Low melody, Morse Code beeps – which player is which? They get more intense, even crowded. Roles reverse, as solitary accordion blurts migrate to the clarinet with organ-like chording behind. A drum solo two-thirds of the way along prompts a speed-up, then a highlight: murmuring accordion, bluesy clarinet. The energy leaks out. Each number offers incongruous beauties – a high clarinet out of Gershwin (portends, starting of track 5), a Euro soundtrack via accordion and stickwork (“ongoingness” in track 7). Restraint is both goal and mission: The End comes on a long-held clarinet tone. No fanfares (human image, track 9).